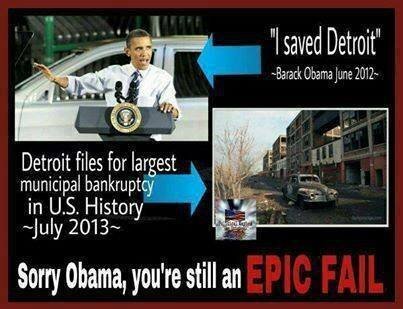 Though I have not seen it reported in the MSM, three days ago the American city of Detroit filed for bankruptcy. Its debts, at $20 billion, are five times larger than the largest municipal bankruptcy debt ever before recorded in economic history. Some of the named causes for the bankruptcy are the shrinking tax base caused by declining population, program costs for retiree health care and pension, borrowing to cover budget deficits (since 2008), poor record keeping and antiquated computer systems, that 53 percent of owners had not paid their 2011 property taxes, and government corruption. I pity the creditors, but I suppose no heads will roll in Detroit. Instead perhaps scapegoats will be sought. I used to volunteer at a retirement home, and became good friends with a man who had lived in Detroit in its heyday. He'd be a little over a hundred years now if he was still alive. Detroit today, well, I hardly know where to begin! The place is literally a decaying wasteland with a few ritzy suburbs. I don't think anyone I know is surprised at the bankruptcy news - sadened, yes, but not at all surprised. It's been a long time coming. What does the bankruptcy mean in practical terms to people living in Detroit? If I'm ever in that part of the world I'd be quite interested in visiting places like Detroit and East St. Louis. Horribly voyeuristic for somebody who lives somewhere entirely different, I know, but I've always been interested in urban blight, the personal stories behind it, and the day-to-day experience of life when a city is run so badly in an otherwise well-developed country. I've been to the worst parts of Naples and plenty of declined former industrial towns in the old Eastern Bloc, as well as the ones in northern England, but it seems nowhere on that scale has been left to fall as far as Detroit. Part of me would like to see them find a way to turn that city around, but when I hear of abandoned neighbourhoods reverting to prairie as the physical infrastructure falls apart part of me would like to leave it to future archaeologists to make sense of, like with some of our medieval abandoned villages. I'll allow you to draw your own conclusions. It's strange to think that people used to refer to Detroit as "The Paris of the West" back in the 19th Century. 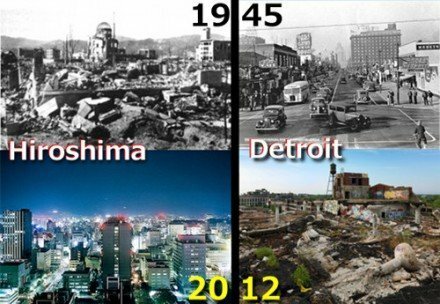 I know that Paris has its own problems in the 21st Century - but has any city in the Western world fallen more dramatically than Detroit? Having lived in the area(Detroit) my entire life I will offer my perspective. I recently read a take on NYC from Pete Hamill the great writer from that city about how nostalgia is the most powerful emotion of New Yorkers.I think the same is true of most older cities including Detroit. 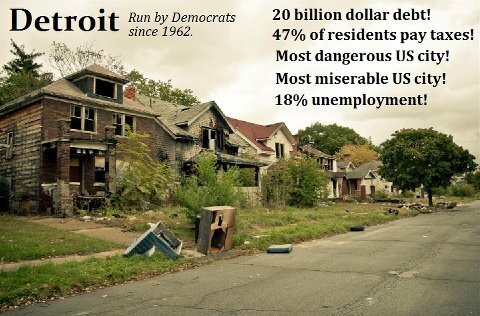 I do remember when Detroit was a thriving city. What sets Detroit apart from anywhere else is it's size, it is massive. Intractable blight and abandonment as far as the eye can see down streets, boulevards and avenues. It has been this way for decades. Detroit allegedly has the third highest collection of pre and depression era skyscrapers.There is gorgeous architecture here.If any of you care to investigate there is the Fisher bldg, the Penobscot bldg, the Guardian bldg and others built during the twenties that equal any building any where of that era or any other. Detroit was a beautiful city. One thing overwhelmingly has killed Detroit_ crime. I am much more liberal than most of you and likely the tenor of this forum.I think it is safe to say that this forum leans conservative. I would like to think I am not stupid. I would like to think that when it is obvious and evident that something is not working it is time to try something else. The stereotypical U.S democratic party approach to crime has not did not and is not working Detroit unfortunately until now has continued this futility.....blame circumstances , racism, any one but the actual criminal and crime. Popular myth here is whites fled the city because blacks moved in. Some probably did. However tens of thousands when asked would relate this typical story ..."My kid were beat up on the way to school"... "My wife was robbed in our driveway" My house was broken into several times.....it goes on and on.. They left and continue to. It amazes me that other cities here especially NYC made crime reduction their greatest priority and the results have been astounding yet Detroit somehow never got the message. Detroit now has an emergency manager with vast powers.This managers powers render elected officials virtually powerless although he has allowed them to keep their pay. Prior to this however Detroit city council and their cohorts the rich ministers of various huge churches behaved and saw themselves in what I consider a grotesque manner. They had cars and staffs and body guards and bloated budgets and a sense of self importance that baffled any half witted person in relation to the condition of the city. There was much corruption as well.In Detroit it is not seen as corruption. To hire friends and family completely unqualified is seen as normal in Detroit; I see it as corruption. It reminds of those countries or nations where the Kings and dictators live lavishly while there is intractable squalor all around. There is an arts scene here and it is garnering some notoriety despite all the uncertainty of bankruptcy. I have heard from time to time Detroit compared to Berlin as a place for artists and the like to go to for cheap rent and the chance to create something.....I have looked the crime rate in Berlin is much much lower with several times the population. Few will live where it is not safe. No one knows what bankruptcy will bring.Some are going to be unhappy.The Detroit inst of arts is having it's collection appraised ; it is a fine collection. But that is what happens when decades of corruption, crime being rampant and a fleeing tax base are tossed into the pot. Here's a selection of abandoned Detroit pictures, not just derelict factories and warehouses like we can see in so many other places, but formerly decent middle-class housing, theatres, churches and schools abandoned to the ravages of time (and looters...). Good photos. The thing is, so many people will say that this is terrible for the black people living there, it is is the result of "under-investment" and so on. But America was not built on "investment", it was built on sheer hard work and people taking a pride in their immediate environment. Who, ultimately, let Detroit go to pot? The people living there. This fact cannot be escaped. Why did they let it go to pot? Because they felt it wasn't really "home"? Because they simply could not do any better? This is where it becomes even more contentious. What are the practical implications of a city going bankrupt? I'd be interested to know. I find this to be a very interesting article by Peter Schiff. The real story of Detroit is that its problems are entirely man-made, and can be summed up in seven words. Private enterprise built it, government destroyed it. That is the screaming headline that is unfortunately absent from the media coverage. Incidentally, Mr Schiff was one of the first people to see the crash coming.